Katherine Linn Sage (June 25, 1898 – January 8, 1963), usually known as Kay Sage, was an American Surrealist artist and poet. She was active between the years of 1936 and 1963, the year she committed suicide. She married the surrealist painter Yves Tanguy in 1940, and was deeply affected by his sudden death by stroke in 1955. A member of the Golden Age, and later the Post-War periods of surrealism, she is mostly recognized for her artistic works, which typically contain themes of an architectural nature. Anne Wheeler Ward Sage left her husband and older daughter soon after Katherine’s birth to live and travel in Europe with Katherine as her companion. She and Henry Sage divorced in 1908, but Henry Sage continued to support his ex-wife and younger daughter, and Katherine visited him and his new wife in Albany from time to time and wrote him frequent letters. Asymmetrically placed large foreground forms emphasize distance in "Danger, Construction Ahead" of 1940. Katherine and her mother established a home in Rapallo, Italy, but visited many other places as well, including Paris. Katherine became fluent in French and Italian as well as English, speaking colloquial versions of these languages that she learned from the servants who helped to raise her. 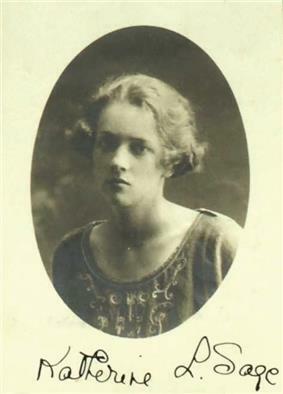 She attended a number of schools, including the Foxcroft School in Virginia, where she became a lifelong friend of the heiress Flora Payne Whitney. In "Margin of Silence" of 1942, forms are figurative, static, and draped. “Kay Sage Papers, 1925-circa 1985, Bulk 1950–1965.” Archives of American Art, Smithsonian Institution. “Stephen Robeson Miller research material on Kay Sage, 1898-1983.” Archives of American Art, Smithsonian Institution. 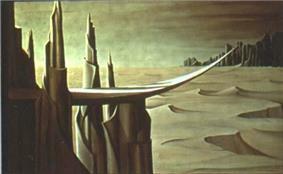 “Kay Sage.” All-Art. Accessed December 11, 2011. “Kay Sage.” ArtCyclopedia. Accessed December 11, 2011. “Kay Sage.” Mattatuck Collections, Mattatuck Museum. Accessed December 11, 2011. “Kay Sage (American—1898–1963).” Accessed December 11, 2011. Morris, Gary. “Surreal Women: Leonor Fini and Kay Sage.” Morphizm. Posted May 15, 2006; accessed December 11, 2011. Poosti, Tara. “Kay Sage (1898–1963): Surrealist.” Sullivan Goss. Accessed December 11, 2011. Vieuille, Chantal. 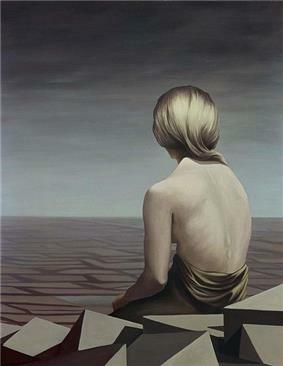 "Kay Sage ou le surréalisme américain." Editions Complicités. In French. Accessed December 24, 2011. Chadwick, Whitney. ‘‘Women Artists and the Surrealist Movement.’’ New York: Thames and Hudson, 1985. Hubert, Renée Riese. “The Silent Couple: Kay Sage and Yves Tanguy,” in her Magnifying Mirrors: Women, Surrealism, and Partnership. Lincoln: University of Nebraska Press, 1997, pp. 173–198. Mattatuck Museum Historical Society. "A Tribute to Kay Sage." Mattatuck, Conn.: Mattatuck Museum, 1965. Miller, Stephen Robeson. "The Surrealist Imagery of Kay Sage" Art International, Lugano, Switzerland, v. 26, September–October 1983, pp. 32–47; 54–56. Miller, Stephen Robeson. "In the Interim: the Constructivist Surrealism of Kay Sage" in Surrealism and Women, edited by Mary Ann Caws, MIT Press, Cambridge, Massachusetts, 1991. Miller, Stephen Robeson. 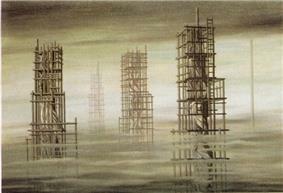 Double Solitaire: The Surreal Worlds of Kay Sage and Yves Tanguy. Katonah, N. Y.: Katonah Museum of Art/Mint Museum, 2011. Miller, Stephen Robeson. Kay Sage: The Biographical Chronology and Four Surrealist One-Act Plays, New York: Gallery of Surrealism, 2011. (Note: This chronology, an edited and revised version of the author's 1983 seventy-eight page chronology in the Archives of American Art – which forms part of the collection named by the AAA "The Stephen Robeson Miller Research Papers about Kay Sage, 1898–1983" – was published to coincide with the Katonah Museum of Art exhibition cited above; it is the most reliable source for all factual information about the artist. Rosenberg, Karen. “A House of Her Own: Kay Sage, Solitary Surrealist.” Women’s Review of Books, v. 15 i. 6 (March 1998), p. 4 ff. Suther, Judith D. A House of Her Own: Kay Sage, Solitary Surrealist. Lincoln: University of Nebraska Press, 1997. Tessier, Régine. “Sage, Kay Linn,” in Barbara Sicherman and Carol Hurd Green, eds., Notable American Women: The Modern Period. Cambridge, Mass. : The Belknap Press of Harvard University Press, 1980, pp. 618–619. von Maur, Karin, ed. Yves Tanguy and Surrealism. Ostfildern-Ruit, Germany: Hatje Cantz, 2001. ^ Surrealism and Women; Mary Ann Caws, Rudolf E. Kuenzli, Gloria Gwen Raaberg; MIT Press, 1991 "In preparing for her Matisse Gallery exhibition, Sage executed her most ambitious surrealist painting to date, Danger, Construction Ahead (1940) … This painting illustrates the desolate wasteland that she favored and the dramatic composition, in which large forms are placed close to one side of the foreground, emphasizing distance." ^ Sage, Kay. China Eggs. Owned and filmed by the Archives of American Art, Smithsonian Institution, 1971, cited in Chadwick, Whitney. Women Artists and the Surrealist Movement. New York: Thames and Hudson, 1985, p. 163. ^ Levy, Julien. “Tanguy, Connecticut, Sage.” Art News 55 (September 1954), p. 27, cited in Chadwick p. 165. ^ Suther pp. 38–39, 41. ^ Letter from Katherine Sage to Flora Whitney Tower, May 5, 1924, AAA no. 2886 ("Stephen Robeson Miller Research Papers about Kay Sage, 1898–1983"), cited in Suther p. 39. ^ Sage, China Eggs, p. 102, cited in Suther p. 46. ^ Sage, China Eggs, p. 103, cited in Suther p. 51. ^ Sage, China Eggs, p. 131, cited in Suther p. 50. ^ Albany Institute of History & Art: 200 Years of Collecting; SUNY Press, January 1, 1998 "She began to use forms covered by rigid draperies, sometimes suggesting figurative shapes beneath, as in "Margin of Silence" 1942, also owned by the AIHA. In these works the poetic titles reinforce the eerie mood of psychological desolation conveyed by the combination of veiled and static forms left like relics from a deserted civilization in barren landscapes." ^ Tessier, Régine. “Sage, Kay Linn,” in Barbara Sicherman and Carol Hurd Green, eds., Notable American Women: The Modern Period. Cambridge, Mass. : The Belknap Press of Harvard University Press, 1980, p. 618. ^ Holzhey, Magdalena. Giorgio de Chirico 1888–1978: The Modern Myth. Cologne: Taschen, 2005, p. 18. ^ Suther pp. 153, 155. ^ Brightlightsfilm.com Surreal Women: Leonor Fini and Kay Sage Documentaries; May 2006 "Her most famous work, 'Tomorrow Is Never' (1955, ...), shows a kind of architecture of doom, a dead world marked by strange, cagelike constructions that appear to contain trapped, suffocating figures. Most of Sage's paintings lack recognizable human beings,"
^ Letter from Kay Sage to Jehan Mayoux, February 5, 1955, AAA no. 2887 ("Stephen Robeson Miller Research Papers about Kay Sage, 1898–1983"), cited in Suther, pp. 161–162. ^ Sage, Kay, journal entry. Cited in Suther, p. 220. ^ Russell, John. Matisse, Father & Son. New York: Abrams, 2001, p. 210. ^ A House of Her Own: Kay Sage, Solitary Surrealist; Judith D. Suther; U of Nebraska Press, January 1, 1997 "In the first painting [Unusual Thursday] the Sage latticework becomes a set of tracks that lead off into invisible space…"
^ The modern renaissance in American art: presenting the work and philosophy of 54 distinguished artists' 1968; Ralph M. Pearson; Books for Libraries Press, 1968; "For this artist plays with opposites. She contrasts a proper bridge or a functional square block with a controlled tangle of non-functional props and beams, as in Unusual Thursday." ^ Time, March 13, 1950, cited in Suther p. 134. 2012, Featured in the exhibition In Wonderland: The Surrealist Adventures of Women Artists in Mexico and the United States at the Los Angeles County Museum of Art. Both Suther and Régine Tessier, the latter in a sketch of Sage in Notable American Women: The Modern Period, note key features of Sage’s mature work. Most of Sage’s paintings focus on free-standing architectural structures, including walls, towers, and latticework, which could represent buildings either under construction or ruined and decaying. Some contain figures that might or might not be human, hidden by flowing drapery. (Le Passage, one of Sage’s last paintings, is perhaps the only one containing a definite human figure; even Small Portrait, thought by many to be a self-portrait, is hardly recognizable as a face.) Like Tanguy, Sage often sets her objects on deserts or plains that recede to immeasurably distant horizons. She renders her forms in meticulous, photographic detail, using a gray-green-ochre palette that Tessier describes as “reminiscent of the sulphurous light before a thunderstorm”. Critics frequently called Sage’s work disturbing or depressing, even when they praised her painterly skill. Critics during Sage’s lifetime frequently compared her work to that of Tanguy, who was better known, and usually assumed that, when their work had features in common, those features must have originated with him. More recent feminist scholars have stated that the influence more likely was mutual—what Judith Suther calls “a constant, usually unconscious interchange.” Suther and others also point out differences between the two artists: for example, the large architectural constructions that dominate Sage’s paintings are quite unlike the smaller biomorphic or metallic forms that people Tanguy’s landscapes. 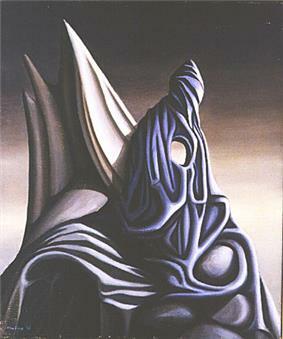 I call Kay Sage a Surrealist because her painting resonates with the unsettling paradoxes and hallucinatory qualities prized by André Breton and his group. . . . More fundamentally, I call Sage a Surrealist because her allegiance to the Surrealist identity lies at the heart of her self-image as an artist. 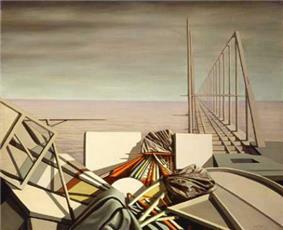 In the painting "Unusual Thursday" of 1951, a jumble of objects in the foreground is contrasted with a latticework bridge leading off into the distance. Kay Sage is known chiefly as a visual artist. However, she also wrote two volumes of poetry, chiefly in French, including Faut dire c’qui est, in September 1959. She wrote three short plays and an unpublished autobiography, China Eggs. None of this, apparently, was enough. Sage wrote in a journal in August 1961, “I have said all that I have to say. There is nothing left for me to do but scream.” On January 8, 1963, she put a fatal bullet through her heart. Following instructions in her will, Pierre Matisse buried urns containing Sage’s and Tanguy’s ashes in the water off the coast of Tanguy’s native Brittany in 1964. Sage seemed to rally for a while after her unsuccessful suicide attempt. In 1959 and 1960 she underwent operations to remove her cataracts, which she had formerly refused to do. Unfortunately, the surgeries were painful and had only limited success, and by this time she was suffering from other health problems as well, including some that may have resulted from her years of heavy smoking and drinking. During 1960 and 1961, as a substitute for painting, she made small sculptures of wire, stones, bullets, and other unusual materials. Catherine Viviano hosted a show of these objects, titled “Your Move,” in November 1961, as well as a major retrospective show of Sage’s paintings in April 1960. One of the chief paintings in a show of 13 of Sage’s oils at the Viviano Gallery in November 1958 was called The Answer Is No. This seems to have reflected Sage’s own state of mind. She filed her will in Waterbury in December 1958, and on April 28–29, 1959, a few weeks after she completed a massive catalogue of Tanguy’s paintings, she attempted to end her life with an overdose of sleeping pills. A housekeeper found her, however, and she was revived. Sage barely did any new paintings after Tanguy died, partly because of her depression and partly because of her decreasing eyesight due to cataracts. Instead, she devoted her time to two projects: preserving Tanguy’s reputation through retrospective shows and a complete catalogue of his work, and writing poetry, mostly in the slangy French she had learned in her youth and spoken with Tanguy. With the help of longtime friend Marcel Duhamel—and her own subsidies to cover most of the printing costs—Sage arranged for a book of this poetry, Demain, Monsieur Silber, to be published in France in June 1957. Around 1955 she also wrote a partial autobiography, China Eggs, which covered her life up to about the time she left San Faustino, but she never tried to publish it. The relationship between Kay Sage and Yves Tanguy was as enigmatic as their art. At the same parties during which he banged his head against those of other men, Tanguy assaulted Sage verbally and sometimes physically, pushing her and sometimes even threatening her with a knife. Sage, according to friends’ accounts, made no response to her husband’s aggression except to try to persuade him to go home. Friends also said that Tanguy did not like Sage’s painting and felt jealous of the fame that came to her. The couple must have shared different feelings in private, however, because all accounts agree that Sage was devastated by Tanguy’s death. “Yves was my only friend who understood everything,” she wrote to Jehan Mayoux, an old friend of Tanguy’s, about a month after Tanguy’s fatal stroke. In "Tomorrow Is Never" of 1955, rudiments of architecture enclose suggestions of human forms within. During these years Sage’s art gained a solid reputation among art critics, though she found it difficult to emerge from the shadow of the better-known Tanguy. Her work was regularly included in national exhibits, won prizes, and was sold to major art museums. She had several solo shows at the galleries of Julien Levy and, beginning in 1950, Catherine Viviano in New York. In the Third Sleep won the Watson F. Blair Purchase Prize from the Art Institute of Chicago in October 1945, Sage’s first major public recognition. In 1951, All Soundings Are Referred to High Water won first prize in oils at the Eastern States Exposition of Connecticut Contemporary Art, and Nests of Lightning won first honorable mention in the 22nd Corcoran Biennial Exhibition of Contemporary American Painting. Sage and Tanguy had a large joint exhibition at the Wadsworth Atheneum in Hartford, Connecticut—their first and almost only exhibition together—in August and September 1954. Although the Tanguys visited, and were visited by, many members of both the French expatriate and American art communities, such as mobile designer Alexander Calder and his family, they had difficulty keeping close friends. “Again and again Sage is described [by people who knew her] as imperious, forbidding, moody, quick to anger, remote, private, solitary, aloof, contradictory, and unapproachable,” Judith Suther writes. Tanguy, though friendlier, became notorious for his behavior when drunk, which included grabbing the heads of other men at a gathering and striking them hard and repeatedly with his own. Sage did the bulk of her mature work between 1940, when she married Tanguy, and 1955, when he died suddenly from a cerebral hemorrhage. During most of that time the two artists lived at Town Farm in Woodbury, Connecticut. (They leased a house in the area beginning in 1941 but maintained a New York apartment for a while as well; in 1946 they purchased the farm and moved to Woodbury permanently.) They converted a barn on the farm into his-and-hers studios, separated by a partition with a door. Their large home was decorated with numerous pieces of Surrealist art and a variety of unusual objects, including a stuffed raven in a cage and an Eskimo mask. Germany invaded Poland in September 1939, beginning World War II, and Sage sailed back to the United States a month later. She immediately set up plans to help the Surrealists immigrate as well and establish themselves in the new country by means of art exhibitions—starting with Tanguy, who joined her in New York City in November. She arranged for Tanguy to have a solo show at the New York gallery of Pierre Matisse, son of the famous painter Henri Matisse, a month after he arrived. Sage had her own solo show, her first in the United States, at the same gallery in June 1940. Sage and Tanguy married on August 17, 1940, in Reno, Nevada, after he obtained a final divorce from duCroq. Tanguy at the time was married to Jeannette Ducroq, but they were separated, and he and Sage immediately fell in love. Breton and most of the other Surrealists were much less welcoming. Sage, still well off, was generous with her money, and the group of impoverished artists badly needed such support, but they resented her wealth and what they felt was a haughty attitude that fitted her former title of “Princess” all too well. Her alliance with Tanguy caused a rift between Tanguy and Breton, who had formerly been close friends. Shrugging off this rejection, Sage went on calling herself a Surrealist. Several stories are told about Sage’s meeting with her future husband, Surrealist artist Yves Tanguy. One came from Greek poet Nicolas Calas, who recalled that he and Tanguy accompanied Surrealist leader André Breton to the Surindépendants exhibit and were impressed enough by Sage’s paintings to seek her out. Calas claimed that Breton was sure that the paintings must have been made by a man.